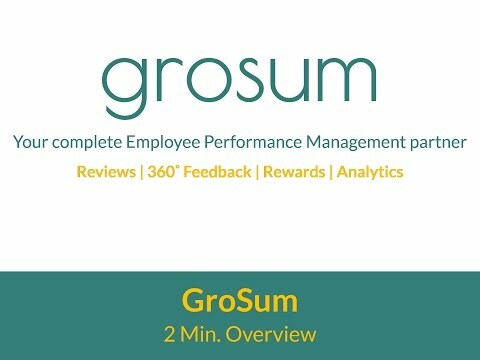 GroSum is a complete, cloud-based employee performance management solution designed to support the traditional end-to-end lifecycle of performance reviews. From goal setting through to final reviews and ratings, GroSum standardizes the scoring and graduation of employees through a company. Pay increments and bonus payouts can be linked to performance, and then delivered to employees with the issue of review, promotion or increment letters generated by GroSum. Finally, GroSum’s Analytics enable managers to drill down and analyze employee performance at an objective level, identify organizational strengths & weaknesses, and compare performance across departments and employees. We have been using this software for more than 4 years to conduct annual appraisalsGrosum provides everything required for conducting appraisals. There are goals, ratings, 360 degree feedback, review letters. Grosum provides everything required for conducting appraisals. There are goals, ratings, 360 degree feedback, review letters. The application is easy to use. Review can be sent across to the peers any time and anywhere. The idea they brought in the software are very unique and one of the most important tool for modern day managers. GroSum brought employee satisfaction in the organization. Best of luck GroSum team.. You are doing great job.Best online Performance Review tool. Reviews can be given to any level. Price is very affordable. Best online Performance Review tool. Reviews can be given to any level. Price is very affordable. 1. Great User Interaction and Experience : Hard to find in Performance Management/HR tools to get good user Experience. Ease of use for Employees. 2. Extensive : Modifies to a lot of different process. Dynamic and Robust. 3. Instant Feedback Tool : Instant Feedback tool is great. Helps to give Feedback quickly across, as easy as giving it on the floor. Helped us to have continuous feedback between doctors and residents. Got 360 for senior staff members. Good support team, available and helped us get started in 2 days. Best business practices – get recommendations on performance management best practices. Process automation – save time on manual tasks, follow-ups, and reminders. On record – all performance data is stored and available at one common repository. Cost of ownership – no more expensive hardware/software installation or maintenance; GroSum provides low investment service model pricing based on number of users. Anytime, anywhere secure access –just like accessing email on the web with a username & password for each user. Below are some frequently asked questions for GroSum. Q. What type of pricing plans does GroSum offer? Q. Who are the typical users of GroSum? Q. What languages does GroSum support? Q. Does GroSum support mobile devices? Q. Does GroSum offer an API? No, GroSum does not have an API available. Q. What other apps does GroSum integrate with? Q. What level of support does GroSum offer?